My wireless internet connection drops off for no reason at all! Have you called your ISP(Internet Service Provider such as AT&T or Comcast) only to have them tell you there is nothing wrong with your internet connection? Chances are they are right and you just need to change your WiFi routers wireless channel or you of course need this better router. This is the best first step. I myself used to be DSL Tier II Technical Support Technician for the biggest provider there is. I have seen all sorts of problems and wireless signal strength connection drop offs are very common but the technicians can not help you fix it. But don’t worry, in this this article I will help you change your wireless channel. This might not be the solution for you though. Especially if you have an old weak wireless N router. I changed my wireless channel but the signal is still poor! Well, this is pretty common. It is pretty much just your old janky wireless N router. Yes, N. Look on the bottom, get your model number and search for it on Google or Amazon. If it comes back as Wireless N, then you just gotta upgrade. Bottom line. What are the symptoms of poor wireless signal? You recently got a new router for your WiFi at home. Your wireless internet drops and reconnects for no reason but when you run a speed test it tends to come back with great results. Others in the house do not lose wireless connection. You only lose connection in some areas of the house. Your non wireless devices do not have slow internet issues. How can we fix dropped wireless connections? Change your SSID Wireless Channel. I find the most common issue is WiFi channel clutter which I will explain below. Unless of course you have wireless N, then it’s just time to upgrade. You can try to change the channel but with the old technology, don’t expect a lot when you’re fighting against all the other newer wireless AC routers in your area. Why do I need to change my wireless channel? When your ISP provides you with a new router, they are factory defaulted in most cases to channel 1, 6, or 11. That means so is everyone else in your building or all of your neighbors. The clutter of devices on the same wireless channel causes interference and the disturbances can cause intermittent disconnects. 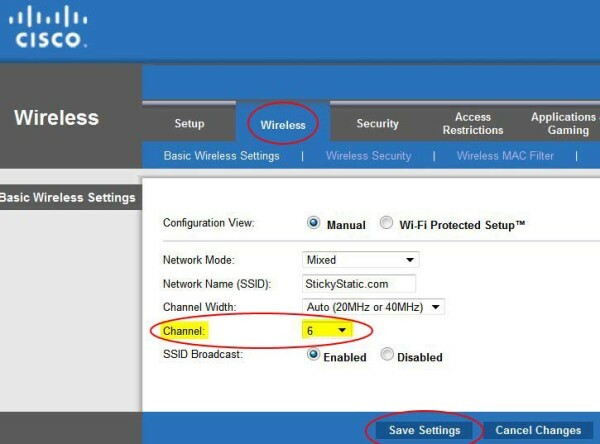 Changing the wireless channel can seem like a difficult task but if you follow these instructions you can easily change the default station on your own. Find a clear wireless channel. If you have an Android phone there is an amazing free app by the name of WiFi Analyzer that allows you to view all wireless channels within range currently broadcasting an SSID. From this data you can see where the clutter is and where you can move your WiFi channel to in order to get better signal strength. If you have an iPhone, you will need to just try other channels blindly and see if it helps. For instance, if you’re on channel 6, try channel 11. Vice versa. Unfortunately the Apple iPhone has banned this amazing application and you have no way of checking out your network signal strength. This is what the WiFi Analyzer app looks like. Very easy to use. In this chart you can see 1 and 11 are over used and already have several wireless networks on them. In this case I simply moved my WiFi to channel 6 where only a few weaker wireless networks reside and have not had any problems. The first step is logging into your wireless router. You will need your “default gateway” for this. Most routers come with this information on a sticker. You’re looking for something along the lines of http://192.168.1.1. But you will also need the username and password. For this you may have to call your ISP. If you’re having trouble accessing your firewall router, then I have more details including default username password combinations for routers here. After you log into your router you are looking for a tab by the name of “Wireless”. The most common wireless router is the Linksys or Cisco router and the screen shot below shows the tab. Newer more advanced routers make this even easier so you should not have a problem finding the wireless settings. In the wireless tab on your router you’ll see an option that says “Channel”. You can only pick a channel between 1 and 11. If you’re on an AT&T modem such as a 2Wire you’re going to need to look for “Home Network” and then “Wireless”. If you used the WiFi Analyzer app I mentioned above, you already have a new channel to test out. However if you are on an iPhone you’ll have to just guess what channel you’re going to use, see how it goes and change it later if it needs to be. Once you change the wireless channel, save and continue, the router may need to reboot. Try this out for a few days and see if the problem goes away. In almost all cases, it will! Unless of course it’s Wireless N, just upgrade already. Welcome to the now. If when using the WiFi Analyzer app you noticed your signal strength was really weak in the first place in the area that you’re having disconnect problems then there are several possible ways to fix that. 1) You really want a strong home wifi router to begin with. If you have an older Wireless N Router, you may just flat our need to upgrade to an AC Class router with dual band. I actually highly recommend this before trying the wireless extender option if you do not have an AC router. 2) If you do already have an ac router and you just don’t have the range because your house is really big, the extender option is the way to go. With your ac router in the main room, you just boost the signal by using the wireless range signal boosting method. You put it in the area of the house with signal strength issues and it recast the signal. I’ll also note that if you are using Time Warner, Comcast, Xfinity or any major cable provider here in the US, you can save money every single month on your internet bill by buying your own cable modem so that you no longer have to rent from them. Good luck and feel free to ask any questions. Please share! My Asus ac3100 has started cycling both 2.4/5ghz off and on. 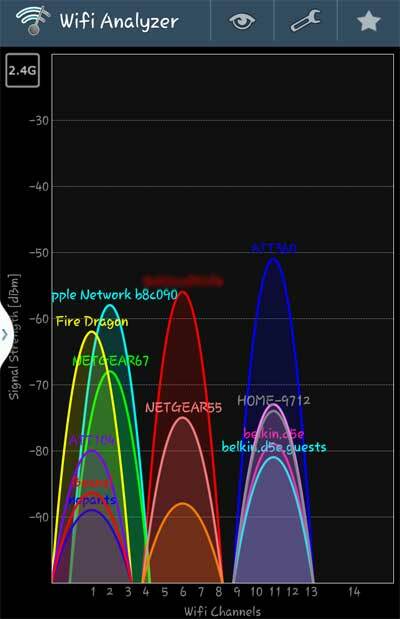 I used the wifi analyzer app to see what was going on. The signals come up then drop. I’ve tried loading the previous firmware, same thing. New router same. Never seen this before. Could be your phone if the same thing happened on a new router. You would have to run these analysis across multiple wireless devices and duplicate it. Could even be your power outlet it’s plugged into. But same issue on 2 routers is likely an external force. How do I change the wireless channel on my NETGEAR router? I got a call saying they were going to disconnect my WiFi. They said it was misused. So please leave on. What about changing the channel width? Would that help too? On the 2.4Ghz frequency it defaults to 20Mhz or Auto which is 20/40Mhz. If you are in an area without interference, the 40Mhz or “wider channel” would be ideal. However it is said that in a crowded area it could be worse. The only thing you can do is try to select 40Mhz but in theory, it will not be better than a 20Mhz width channel. Sadly wireless crowding is becoming more and more of a problem now and even here in my apartment complex, I am forced to use the 5Ghz. My 2.4Ghz is unusable for my needs. I have even gone as far as to running a 50 foot cat 5 to my bedroom for my desktop computer because I game on it and wireless is not an option. But in your case, try a wider channel width and if it fails, switch back to 20Mhz or auto. Is it normal to have to reboot the router everyday? I have several devices connected to wifi including 2 cams that run 24 hours, during the day it can slow up to 30MBPS…… but after a reboot it’s back up to 175MBPS just seems like I’m rebooting everyday to get these speeds back…..
No, that is not normal and it may be time to replace your router. Some routers are easy to reboot from the web interface so that is an option instead of getting up and walking over to reboot it. My recommended ASUS even has a scheduler to auto reboot on any day at any time that you choose. I do not use it because I never need to reboot it but it is an option. Interesting article, however it did not help me. I have a 4 year old E Machine 64 bit PC and Comcast hard wired to my house. The tech has been out 3 times in last month to try to find problem with internet hanging all day long at intervals when air force base is flying over. I was told by Comcast that Yes there is airplane interference, but Tech says NO WAY this can happen. Also tells me my PC is too old and needs replacing. I do not believe this. I am at a loss. I only have internet with Comcast no Cable TV. Help Please if you have any ideas. My guess is it could be the computer too. If it is hard wired, meaning you are not using wireless, then it is likely the computer. The only real way to test this would to be using another computer all day and seeing if it hangs at the same time. I have a section of this site for new computer builds if you are looking to upgrade. One test you can do is run a continuous ping while surfing and monitor the results when it hangs. I have changed my broadband from sky to talktalk went live 4 week’s ago, but I have had nothing but bother since. Engineers from talktalk and BT say the line and install is OK yet I’m still having problems. Any suggestions please? It’s hard to say. I would start with running test on the wireless such as the app in this article. I would also run a continuous ping to the router and to an outside source like Google and see where the packet loss is. I would also do one from a wireless computer and one from a hardwired computer. Those things will help you pinpoint where the actual connection drop is. We have Comcast “Business” for our student household, since we’re online a lot with multiple devices. Because of neighboring demolition (we’re housed on an old navy base that’s slowing being converted to a nature preserve), the Comcast line we’re fed from on the adjacent property got dug up and the small “tap” (splitter) plus larger box (“amplifier”) both were left lying on ground. So, “Problem 1” of course was kids / vandals. But “Problem 2” is *daily* ), dropped service on our 2.4 GHz setting — but *mornings* only! The tech suggested the standard “change your bandwidth” answer, but dismissed my suggestion that condensation from marine air on our island (+ gardeners’ watering, mowing, whatever), might be a factor. Any suggestions? Well, if it is only dropping on the 2.4GHz channel, it would likely be something with your router and not the outside lines at all. I would go deeper into troubleshooting with this one. Like run a continuous ping from something connected on the 2.4GHz band and a ping from the 5GHz and even one from a hard wired device. This would tell you where the disconnects are really coming from. With comcast business you are paying for fast turn around time to fix problems, not a different or faster wifi/ internet connection speed. If you pay for the boost with turbo you may get more mbs without the business cost. I have a Comcast router and when I go to wireless it doesn’t say anything, just active and mac address crap. This is not specific enough for me to understand. Comcast provides you a router but it is a different brand and model number listed on the unit itself. How are you accessing wireless settings? I changed the Xifinity router wifi channel selection from Automatic to Manual, and selected a different channel from what it was operating on at the time (channel 40). So far so good! I downloaded the WiFi Anylyzer. When I open it, I immediately get a message stating my Network Connection is weak and I should contact my ISP. I am unable to use the app. Even when standing next to the wireless router? Check to subscribe. Free giveaways and new articles only.